Bayern Munich are keen to sign defender Alex. The Bundesliga side turned their attentions to the 28-year-old after failing to agree a fee with Manchester City for defender Jerome Boateng. Alex's departure would leave Branislav Ivanovic, John Terry and David Luiz as Chelsea's senior centre-backs. The Blues have yet to move into the transfer market this summer, having spent £71m in January on Luiz and striker Fernando Torres. Chelsea have yet to comment on the reports. 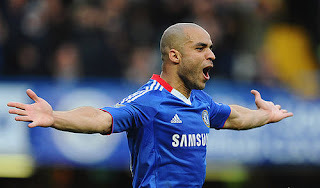 Alex joined the Stamford Bridge club in 2004 but was immediately loaned out to PSV Eindhoven because he had not played enough games for Brazil to qualify for a work permit. He helped PSV win three Dutch league titles before finally completing his move to Chelsea in 2007. Alex was behind Ricardo Carvalho and John Terry in the centre-back pecking order until Carvalho moved to Real Madrid at the start of last season. Alex became first choice before a knee operation in December ruled him out for two months.